She loved them and wanted a set, but didn't want to pay the $150 price-tag, so she asked me if I could make some for her... so I did! First, you need to make a pattern (not shown) then you need to trace the pattern onto some wood. I used a cedar fence slat. Then cut out the birds using a scroll saw. 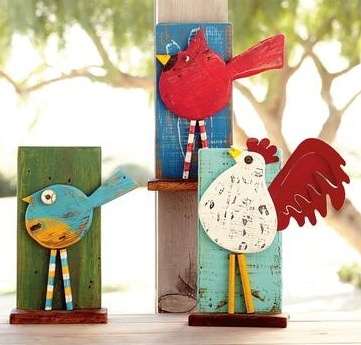 After you have sanded the birds, slap some stain on them and wipe off the excess. I then painted the birds exactly like the magazine picture. To make them grungy, dis-stress by sanding. When cutting out the birds, be sure to cut out back boards and a bottom perch boards. Sand, stain and paint these as well. Next, use a nail gun and attach the perch pieces to the back boards. Now, nail the bodies onto the back boards. The best way to attach the legs is to glue them on with wood glue. I didn't want to try nailing it because I thought the nail would split them in half. Now, stand back and admire your finished product.